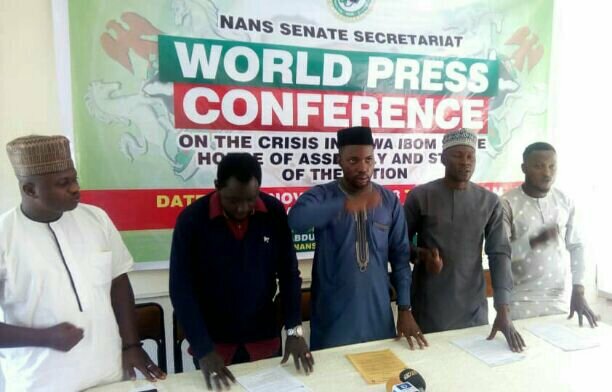 Leadership of the National Association of Nigerian Students (NANS) on Wednesday threatened to resist attempts by opposition All Progressives Congress (APC) in Akwa Ibom State to truncate democratic processes in that state. Addressing word press conference at popular Arewa house in Kaduna North local government area of Kaduna State, Senate President of the students body, Comr. Abdulmajeed Oladimeji Oyeniyi said, NANS was fully aware of plans of minority APC members in Akwa Ibom State House of Assembly to unconstitutionally impeach the speaker of the house and later impeach the state Governor, Emmanuel Udom ahead of the 2019 elections. According to him, NANS leadership will mobilise students in their numbers to invade the state capital (Uyo) if hired political thugs are given cover by security agencies to disrupt legislative activities in the state’s assembly. “We are in receipt of credible intelligence highlight plan by the opposition to use thugs to invade the Akwa Ibom State House of Assembly and prevent the House from carrying out its legislative business of law making. He said, “its important we draw the attention of the entire world to this undemocratic act that is about to be perpetrated by the opposition in Akwa lbom State. “The State legislative arm is an independent arm that do not required the intervention of external body. We are pretty sure that the target is not directly on the speaker but the person of the governor, that if the opposition succeeded by taking over the state assembly, it will be easy for them to impeach the governor. “Nigerian Students wish to categorically state that, the era of truncating democracy or will of the people, has, for long gone and our democratic systems have come to stay. We hereby advice the opposition to desist from this act of unpatriotism to our country and her citizens. resolved the ongoing strike embarked upon by the Academic Staff Union of Universities (ASUU) in the interest of Nigerian students and image of the country.